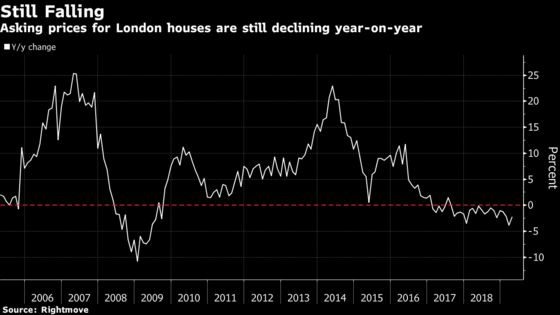 Asking prices for London homes rebounded in April, and beleaguered sellers hope the extension of the Brexit process will help bolster the property market in coming months. Average values increased 1.1 percent after dropping by the same amount in March, property-website Rightmove said in a report published Monday. That left prices down 2.2 percent from a year earlier, with the number of sales agreed by real-estate agents falling 5.6 percent. While values nationally are also lower from a year earlier, there were signs of strength in April, with asking prices rising 1.1 percent. Family homes showed the biggest increase, indicating that the pressure for households to get on with moves, for reasons such as proximity to schools, is outweighing the political turmoil over Brexit. European Union leaders last week agreed to postpone Britain’s departure until the end of October, which could help boost transactions after months of uncertainty that have weighed heavily on activity, especially in London, according to Rightmove. Still, Britain is not out of the woods yet. A separate report by Bibby Financial Services said U.K. businesses had their least confident start to the year since 2014, with more than half of small and medium-sized enterprises believing the U.K. economy will fall into recession. The average amount firms planned to invest fell for a fourth consecutive quarter, it said, citing a survey of 1,000 SME owners questioned between Feb. 11 to March 15.